I'm a little early with the latest of installment in the Cuban Political Prisoner of the Week series, but Diosdado González Marrero and his wife, Alejandrina García de la Riva, deserve the attention right now. In a recent e-mail distributed by the Coalition of Cuban American Women Alejandrina describes how the authorities are threatening to try her husband on new charges that he had a sharp object in his prison cell. She also describes how a pro-Castro street mob has threatened her. Diosdado — which means "given from God" — already is serving a 20-year prison sentence he received in 2003 during the "black spring" crackdown on the Cuban dissidence movement. A member of the Peace, Democracy and Liberty Party, he was convicted under Law 88 of anti-state activities. While in prison, Diosdado has refused to remain silent, transmitting through his wife horror stories about the gulag. He also has gone on several hunger strikes to protest his treatment. "It's such a tragedy that these people have to suffer like they do," a friend wrote to me in an e-mail. "I love Diosdado's name — Given from God — and he truly is a man worthy of his name." My name is Alejandrina García de la Riva, wife of Cuban prisoner of conscience, Diosdado González Marrero, who is serving a 20-year sentence in the Provincial Prison of Kilo Cinco y Medio in the province of Pinar del Río. I wish to condemn events that took place on September 23, 2006, when prison authorities locked up my husband, Diosdado González Marrero, in a punishment cell or “tapiada” ( prison cell with no windows or light ) because, according to a high authority official called “Osmany”, a sharp pointed object was found in his cell. An inspection was carried out on that same day, September 23, at the entire prison barrack # 8, where my husband is confined. I must clarify that prison guards carry out a search only when all the prisoners are moved away in a hallway distant from their belongings. In addition, when family members visit their loved ones in prison every inch of our bodies is searched and the prisoners are thoroughly searched as well. During a prison visit nothing that might inflict injuries to any of the prisoners is allowed. Head prison officials “Osmany” and “Alejandro”of barrack # 8 informed me via telephone that my husband will be prosecuted once more…that he will be taken before a tribunal for the common crime of keeping a sharp object in his cell. I hereby inform national and international public opinion that I make prison authorities at Prison Kilo Cinco y Medio responsible for introducing sharp objects inside the prison compound. 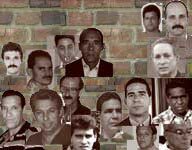 This is a manipulative tactic implemented by the Cuban government and by Cuban State Security in order to bring legal action against my husband once more. 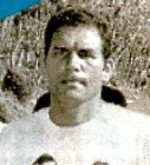 Diosdado González Marrero, is a peaceful man imprisoned for his independent ideas. If he has never practiced violent acts and is confined alone, there is no reason why he would possess a sharp object in his cell. Immediately after, on Sunday September 24, my house was surrounded by forces of the Communist Party, of the “Committees of the Defense of the Revolution”, of the “Federation of Cuban Women”, who carried-out a mob attack or “act of repudiation” to prevent anyone from visiting my home on that day. My children and I endured this violent attack that began the night of Saturday, September 23, 2006, until Sunday, September 24 at 3:30 p.m.